Will Wal-Mart Raise Its Dividend in 2017? The big-box discount retail giant has an impressive dividend growth streak, but its stock is down almost 25% since 2015's highs. Should investors count on a payout boost this year? Big-box department stores revolutionized the retail industry in the late 20th century, and Wal-Mart (NYSE:WMT) remains the industry's giant. With more than 2.3 million employees worldwide, Wal-Mart is the biggest private employer in the nation, and the company has rewarded long-term shareholders with 20% average annual returns over the past 40 years and an impressive streak of raising its dividend payments every year for more than 40 years. Yet recently, Wal-Mart stock has fallen dramatically, calling into question the company's future growth prospects. Let's look more closely at Wal-Mart to see whether investors can count on the Dow component to raise its dividend in 2017. Wal-Mart's track record of boosting its payouts has been extremely impressive, and the gains were particularly large over the past 15 years or so. Double-digit percentage boosts to the quarterly dividend payment were common, and as recently as 2013, Wal-Mart made an 18% increase to its dividend, capping a run that had almost doubled the quarterly amount just since 2008. 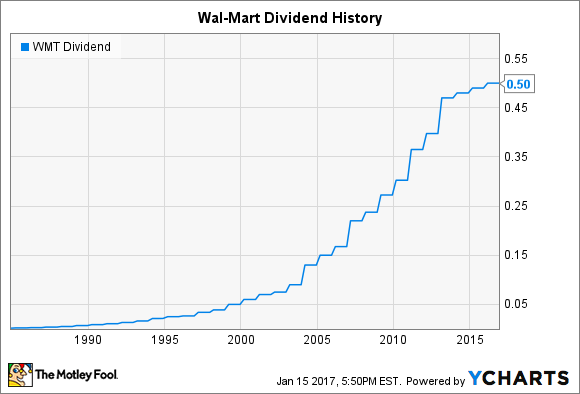 Yet in recent years, Wal-Mart has almost done away with dividend growth. The company has made token increases of $0.01 per share in three consecutive years, amounting to raises of just over 2% each year. That has had the effect of extending Wal-Mart's streak of annual dividend increases, but it hasn't given investors any confidence about the company's true commitment to income investors. Why has Wal-Mart's dividend growth come to a near-standstill? A combination of factors has hit Wal-Mart hard over the past couple of years. First and foremost, terrible conditions throughout the brick-and-mortar retail space have spared few companies, and it isn't entirely fair to single Wal-Mart out. In fact, some department store retailers are facing much bigger challenges than Wal-Mart is, and high-end retail in particular has had to deal with challenges that Wal-Mart's more mainstream core of shoppers hasn't yet posed. Yet Wal-Mart does have some company-specific issues as well. The company decided to close all of its Wal-Mart Express stores in early 2016. The concept had grown to more than 100 stores, but the attempt to bring the Wal-Mart name to a store size far smaller than the traditional supercenter didn't pick up traction. The retailer still has high hopes for other concepts like its Neighborhood Market offering, but closures of both that concept and traditional supercenters also show some that Wal-Mart has had to optimize its store portfolio to avoid taking financial hits from sluggish conditions in retail. In addition, despite big spending to boost its online presence, Wal-Mart still hasn't found a way to compete effectively against the biggest online-only retailers. Moreover, Wal-Mart is facing some cost increases that not all of its competitors have to deal with right now. Wal-Mart has boosted its base wages over the past two years, with increases to $10 per hour as of February 2016. But many states are boosting minimum wages on a long-term path that could force further increases. Moreover, it will be hard for Wal-Mart to match some of its big-box peers, simply because of the nature of its business model. Even though Wal-Mart has had difficulties in generating as much growth as investors would like, however, the company does have the capacity to boost its dividend. With a payout ratio well under 50%, further increases in Wal-Mart's quarterly payout wouldn't have a dramatic impact on its available cash flow. That would still leave the retailer with plenty of options in considering what to do with the bulk of its capital. Based on its recent actions, investors shouldn't expect Wal-Mart to give them more than another $0.01 per share token increase in 2017. That would take the quarterly payment to $0.51 per share, and leave the yield at close to 3% while extending Wal-Mart's impressive streak for another year. Before investors can count on bigger hikes, Wal-Mart will have to restart its growth engines and demonstrate that it can compete effectively not only against its department store peers but also against online retail giants without the brick-and-mortar baggage that Wal-Mart has to carry.